It is well known that the human body is the most amazing instrument you'll ever own, far more complex than any computer. It is the vehicle from which you move and express yourself. It is the house that contains you. You can't trade it in, or buy a new one: it’s yours for life and it is the only one you will ever get. To look after it and to unsure that it operates well is the smartest investment you'll ever make. Build it strong, and stable, and build it to last. An aligned, stacked framework from your Feet through your Legs, Hips, Spine and Shoulders to your Head is your Power Foundation. When your foundation is built properly, your entire framework acts like a spring to absorb and transfer forces. A spring in your step is a sign of youth. The loss of bodily spring is one of the first signs of physical aging. Your body is composed of a structural Skeleton of Bones held together by Muscles, Tendons and Ligaments, plus a network of Fascia, connective tissues that wrap around everything like a spider web. Your entire structural framework is one integrated system. Each part assists every other part, ran by the neural networks of your Central Nervous System, under control of your Mind. When any one part is moving, the whole-body is moving. A misalignment anywhere in your foundations, such as stooped shoulders caused by poor posture sends a ripple of disturbance through your entire body. Before long it is struggling. Some parts become weak and can't provide the necessary support, while others become tight, restricting bodily movement. Poor Posture leads to a Poor Structure. An example of sitting in front if computer every day, shoulders rounded, head forward for hours. Your body adapts by shortening some muscles, and lengthening others. You may also get stuck in a state of structural compression with uneven stress to your joins, and spine increasing the degenerative process. The effort you require to hold yourself upright increases. You fatigue quicker, with increased aches and pains everywhere. Eventually, your postural habits become your structure. Your upper Spine becomes bowed. You can no longer stand upright. Good posture is natural alignment that leads to a resilient structure, whereby pressure is evenly distributed. An example of a postural habit to maintain, is sitting upright. The weight of your Body should rest on the two Knucklebones at the base of your Pelvis to prevent flatting, or over arching of the Lower Back. Your Head should be positioned, slightly forward and up, with the Chin tacked in, to release your Neck. This natural posture lengthens and widens your back, strengthening your structure framework, preventing degenerative, slumped process. You are your posture: those that age well, age well posturally!!! Your body works as a whole, and can only be changed as whole. Physical integration of every muscle in your body creates ideal muscle tone for all muscle attaching to a particular join to allow what joint its complete range of motion. Static posture is the Alignment of your Body while you are still. 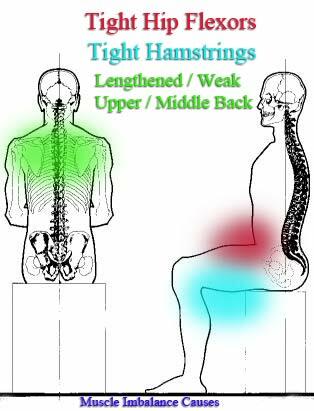 More importantly static posture refers to the length-tension relationships of your Muscles and the corresponding alignment of your Joints. You may first notice posture problems when someone or yourself observes your static posture. The length-tension relationships between working and opposing Muscles are especially important to dynamic posture. Dynamic posture is the Alignment of your Body during movement. Poor dynamic posture can influence static posture and vice versa. Since many exercises are repetitive movements, it is important to keep your dynamic in mind. Based on my observation, majority of people and my clients have upper posture misalignment. It is called Upper Cross Syndrome – Neck/Head extended ahead of their body, rounded shoulders and ‘winging’ shoulders blades that stick out. Clients complain about Headaches, Neck pain, Rotator Cuff problems and pain in the mid-Spine and upper Back pain. These are symptoms. The problem is - shortened Pectotalis major and minor - muscles of the Chest and lengthened, weak Trapizios and Rhomboids – muscles of the upper/mid Back. Corrections and improvements can be done through stretching based on the Art of Movements – Kinesiology.